This session was played on Friday, December 28, 2012. 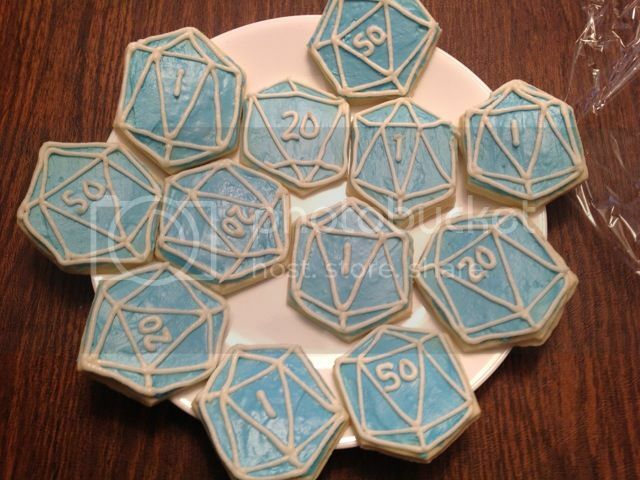 Tasty treasures for Game 50! 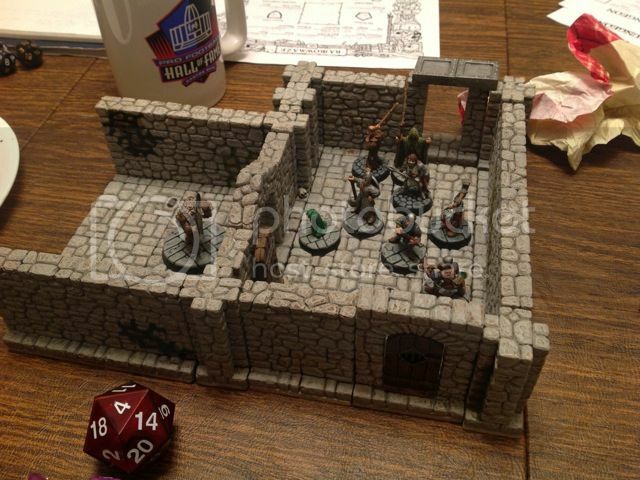 Once again the adventurers went back to the bricked up wall that fustrated them so. Again while attempting to break on through to the other side footfalls were detected. A lot of feet were heading our way. The adventurers waited in the room opposite the wall and silently waiting for them to pass. That is until snake decided to open the secret door. The sound of grinding stone echoed throughout the area. The door to the main corridor was greased and the group waited. Soon the party, growing weary of waiting for the foem opened the second door only to be greated with an attack. Several bugbears, necromancers and other nefarious creatures assulted them. Running in the bugbears began the assult and were swiftly dealt with. The necromancers in the other room casted spell but seeing their comrades die, one turned invisible and maybe left the scene. The group looted gold, 4 symbols of set and a set of spellbooks. Again the bricked wall lay before us and as we began smoting it, more rumblings were heard. Running around the corner the group prepared a trap, oiling up the corridor as undead hecuva, 6 of them, shambled forward. Lighting the oil on fire dispatched 2 of the creatures with 4 to go. We backed up and finised the rest off, as Kleego smashed them to bits with a natural 20, earning a cooking from the plate. As we enetered the bricked up wall 3 bodies and several alcoves were spied as well as a glowing gem in the wall. Ziggy went in to find a fine suit of studded leather and 950 gold but not before becoming englufed in flames ruining is already questionable good looks. A quick trip back to have items identified and to collect their wits and two new bitc- umm hirelings, Lermor hook hand and Turm the barley literate. Together the group ventured back to the maze. An are with large statues and huge doors persuade the party to not enter. So they took a smaller passage to the north. Back in an unchecked area the group stumbled upon a pit. Jarrol, brave hireling of Snake went to the pit, turned purple and collapsed in. Afterward a rope and hankerchief was tied to snake as he navagated to the pit seeing purple mold devowering the sword guard. Oil quickly cured the problem of the mold but not the dead Jarrol of the way of sub. He will be vaguley remembered. The pit was not a total loss 295 gold and 100 platinum was found fused together in an unholy lump. Further investigation found a small vase, a sapphire walking stick named p-imp and an ornate quill. We moved down the hallway and uncovered a pit by Norda Snake's second hirling who promptly fell in and was eaten by the ghoul at the bottom. Further adventuring uncovered a room with several alcoves. As they began to search several zombies could be heard shuffling. As the group took up defensive positions and began attacking the undead, a wight appeared, emerging from the alcoves. The zombies began to light on fire and exploded damaging everthing in their path. Dispatching the rotted corpse the wight wis obliterated by Kleego who rolled a 20 earning a light on the die and another cookie. Ending the Wight's existence before further damage could be done. Unfortunatly though it attacked our monk touching him in the wrong places and draining his "essence"/ With a coral figure, AC bracers a silver kilt pin and 266gp the party left to drink and count their blessing in town.